You can waste a lot of CSET prep time. Many go in the wrong direction and study the wrong content. Others partake in a lot or CSET test prep activities. They feel and look busy, but in reality are doing little or nothing to actually move themselves to a passing score or their California teacher credential. Doing things that have no impact on your score will cost you big time. It a cost you can’t afford. The point is: Whether you’re using CSET practice test questions, study guide books, flashcard or a prep course, you need to get the most productivity out of the limited time you have. You wouldn’t consciously choose to take 3-7 times longer than necessary to prepare for the CSET. So why would you? Why delay your bright future in education and needlessly extend your CSET test prep time months longer than necessary? Whether you taking the Mathematics, LOTE exams like Spanish or French, Science, English, Social Science, Health Science, Chemistry subtest, Physical Education or other test you can use this to crank-out more score popping points out of every test prep session. Real CSET Prep Or Just Feeling Busy? Daily routines are molded into your life over years. Unfortunately, some of these habits can destroy the CSET exam success you deserve. Do you tidy your room or clean the house instead of studying for the CSET? Do you try to distract yourself with some activity because you’re really trying to avoid CSET test prep even though you know it’s you’re highest, long-term value activity you should be doing? Some people invite interruptions by leaving their cell phone on, email alerts and computer on or allow people to walk in and start talking to them. Maybe that type of test preparation got you through college exams. And maybe you feel it’s rude put people off when they call or demand your attention, but will those methods allow you to pass the California Subject Examinations for Teachers? If you’re not actually increasing your score in each hour of CSET prep, you’re just not being productive in your study sessions. For most test takers it’s an illusion you can get your California teaching credential with such ineffective preparation habits – so identify and target your big roadblocks in test practice. People have a tendency to do the easy thing first when studying for big standardized test. So even if you’ve managed to get yourself to study and postpone less important things, you must to prioritize your test prep. You’re just not going to pass the CSET if you just dig into it without a plan each review session. Mindless test prep for the CSET when you’re not even sure if the material be on your exam is time you can’t afford to waste. Create list of the domains of your California teaching credential test that account for the most points and you feel you need to brush up on. These are usually the aspects of the CSET subtests you don’t like and have been avoiding. Always start your CSET review on those areas of the test first. Study the list of specific subject matter from the official California Commission on Teacher Credentialing (CTC) or NESINC website so you’re certain you’re hitting the bull’s eye in each preparation session. The biggest waste of time is thinking you’re being productive because you’re working hard, but working hard in a direction that won’t help you pass. Avoid skipping over difficult test content in each CSET prep session. Do not rationalize that you’ll knock out the easy ones first and then go the more difficult areas of the exam later in the day or in later in the week. The problem is, by the time you get around to the difficult stuff you don’t want to do it because your energy levels will be lower and you’ll feel even less motivated to tackle it. What also happens is we always end up having less time than we think. By the time you’ve reviewed the easier content knowledge, you’ll run out of time for the more difficult parts you really need to work on the most. Over time doing the more enjoyable and easier crowds out the most important things we need to do in order to pass. In CSET test prep weak content knowledge areas are usually where you could get the highest increases of your score with the smallest amounts of time and energy in test preparation. So always do that first when your energy levels are the highest and you have the most time. Your CSET prep is most effective if you create a list of things you need to cover each week. After you have your list, number each item in your list in the order of priority. Then, always start on the area where consistent review can bring up your score the most. When you force yourself to start your CSET exm prep on the difficult and uncomfortable areas of the exam, you’ll develop a habit of focusing on what you need to get a passing score. You won’t be wasting hours studying what’s not on the test or only what might marginally help you. Use list as visual reference as you prepare for the CSET. Check off the sections of your CSET study guide you’ve already worked through. It’ll help keep you on track and avoid putting important things off until later. Ask yourself, “What tasks and activities do I do everyday or week I could either cut in half or completely eliminate until I take the exam? Most people who say they don’t have time to study for the CSET are usually wasting time. They do low value activities that are just bad habits or a waste of time in the “big picture.” Examples are: watching hours of TV, time sending emails, Facebook, surfing the internet, talking on the phone or lacking control over interruptions. If friends are a distraction and causing you to procrastinate your studying, be an adult. It’s not high school anymore. Explain to friends and even family what you’re trying to accomplish. Illustrate the enormous cost if you don’t buckle down for a few weeks. Make it clear you’re not forgetting about them. As a matter of fact they’re very important to you right now. You need their support during this challenging period so you can concentrate without interruptions and get a passing CSET score. If you failed the CSET, you’re probably aware your prep habits and study strategies need a massive overhaul. For example, did you try to save $23 on that high quality, comprehensive study guide and practice questions you needed to pass? Then did you end up wasting hours preparing for the CSET with “might be” exam content on Wikipedia? Want to take your CSET prep up another notch? 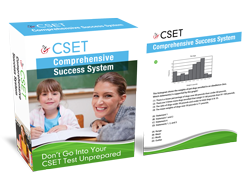 Get your hands on the ultimate CSET exam practice and test coaching from the educational experts. Haven’t found adequate CSET test prep classes and materials to pass your California Subject Examinations for Teachers? Don’t let that get you down. In fact, listen up to the inspiring story of Alicia. She failed the first time. However, she discovered how to navigate her way through a maze of mediocre CSET practice tests, study guides, preparation workshops and finally passed. Alicia knew she couldn’t gamble with CSET prep courses or books. She had to pass her teacher California teacher credential exam this time because it would be her second attempt. When she first prepared for the CSET, she thought her real-world teaching experience, plus what she learned in her college classes would be all she needed. However, once she got a devastating failing score, Alicia knew that she had to shape up fast or risk losing the career she went to college for. She decided to get CSET test prep book from her local Barnes and Noble bookstore. Having already taken this test before, she knew what the test looked like and what was tested. Therefore, she was disappointed with overly generic CSET test preparation content and inaccurate practice questions. The dry, 400 page books read like the expensive textbooks she bought in college. However, those type of review materials didn’t prepare her. They were so non-user friendly and frustrating to use. It turned out to be a very impractical tool for getting a passing score. Most of the CSET test prep books she bought on Amazon.com didn’t have a single practice question that covered the actual test material! A friend had told her about test prep for the CSET created by CA educators who passed. They had outstanding CSET practice test questions that appeared like the actual exam. In this online course, Alicia’s friend received help from a test prep coach who is a licensed California educator. This expert passed and has helped hundreds get a passing score. They continued to chat into the evening. They were perplexed how teacher candidates after 4 or more years of their life in college, some how think they’re going to prep the most important exam of their life without any help or investment in quality preparation materials. Can it get worse that this? Some CSET test takers after spending a small fortune (of approximately $10,000, $30,000 or more) in student loan debt, think they can pass with $21 book. (The authors of most CSET study guides are written by someone who never took the California Subject Examinations for Teachers!) Moreover, some teacher candidates think they know more about how to pass this test than someone who passed their specific exam and taught hundreds/thousands of others the key to a passing score. No wonder why so many education students and professionals seeking a second career in education are prepping for the CSET wrong and failing. Alicia refused to fail a second time. She didn’t want to be in the group of test takers who think they’re going to pass by keeping a warm seat at the test center. Although she was low on funds and skeptical, she signed-up for a top notch CSET prep course by California teachers who passed. Immediately, she got online access to a ‘fast track’ practice test and study guide that matched her actual exam. Her assigned test coach was available 7 days per week and even evenings. She assisted in pinpointing areas where she needed the most work in order to pass. Over the next few days Alicia strengthened her overall test-taking skills, brought up her vulnerable areas to passing level and dropped her text anxiety. How to spot – and avoid – the trick questions. CSET test prep that reveals: How to boost your score by 10, 20 and even as much as 37% picking-up points to test questions – even those that you don’t know anything about (this was a real lifesaver for Alicia!). How to spot those keywords in test questions that practically hand out the right answer. CSET study materials that included math equations and formulas known to appear on the exam. Once she was armed with this kind of exam help, Alicia was ready to try out everything she learned on her practice questions. And sure enough, with every example test she took, her score grew exponentially. Within 3 short weeks she passed with fly colors! Needless to say, Alicia now has the California teaching position of her dreams – isn’t it time that you got yours? If you need to pass the CSET Multiple Subjects, or Single Subject exams like the Science, English, Health Science, LOTE exams like Spanish or French, CSET math, Physics subtest, Social Science, Physical Education, there’s a faster and easier way.